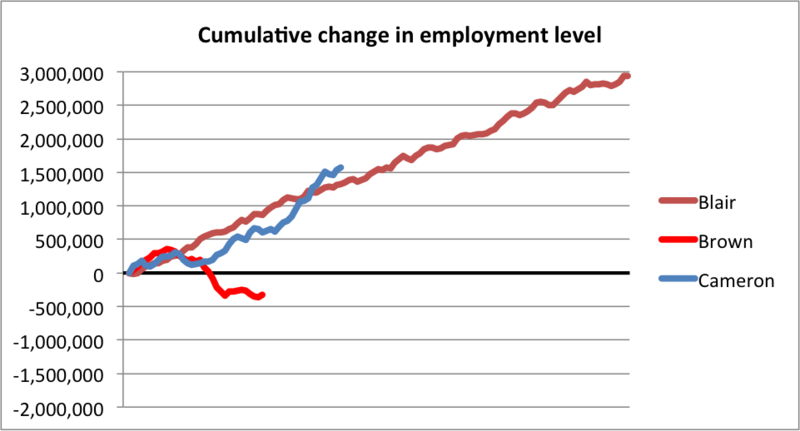 Fraser Nelson's interesting article for the Spectator from a few months back here provided a novel presentation of UK employment levels, comparing changes by Prime Minister under the headline Cameron the job-maker. I looked at the impact of arrivals from abroad on these numbers for Blair, Brown and Cameron here on both levels and rates of employment and subsequently here. 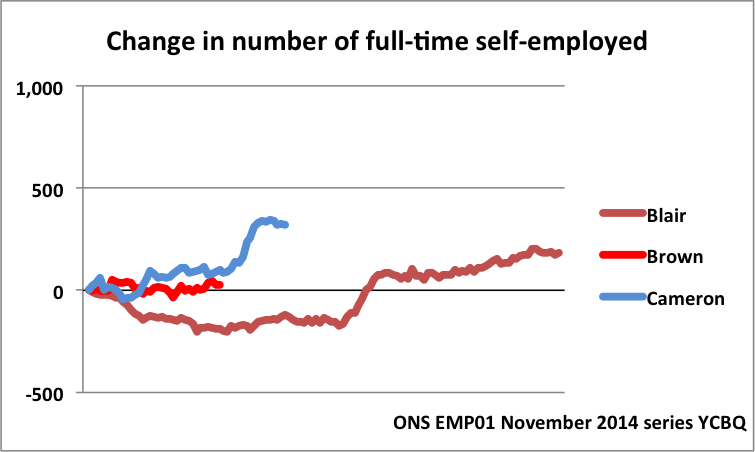 As I went on to point out here, Fraser's chart did not distinguish one job from another, and so did not bring out the extent to which the relative proportions of full-time and part-time work had changed, or proportions of employee and self-employed. I concluded that the actual degree of success might become clearer over the next few quarters. With a few more months having passed, it's worth another look not just because there has been some further change but also because the ONS is now (from the October 2014 Labour Market Statistics onwards) using new figures following census-based revisions to population estimates from 2001 onwards. "A notable effect is the slightly stronger rate of employment growth between mid-2004 and mid-2008. This mainly reflects the impact of the upwardly revised estimates of net international migration in the revised population figures". The monthly Labour Market Statistics release from the ONS last week (on 12 November) took all this into account and also provided a quarterly update on employment of people from outside the UK. 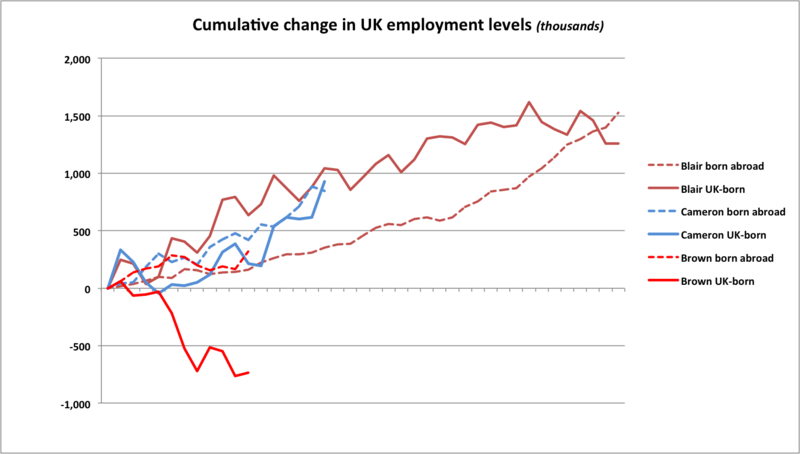 The overall picture of changing employment levels by Prime Minister now looks like this. Note that the ONS revisions have pushed change under Blair up to near enough 3 million, rather more than in Fraser's original, and slightly dragged back change under Cameron. 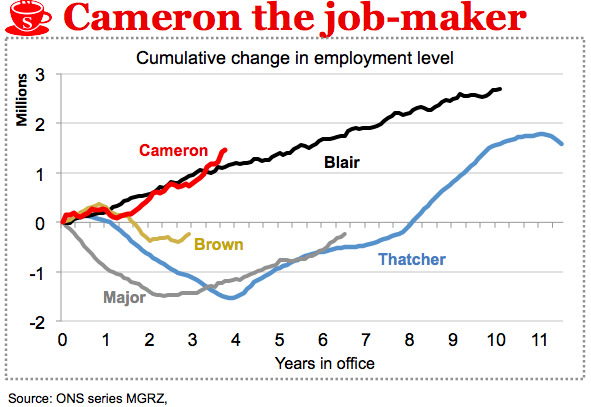 But Cameron still appears to have overtaken Blair and to be just about keeping his lead steady. 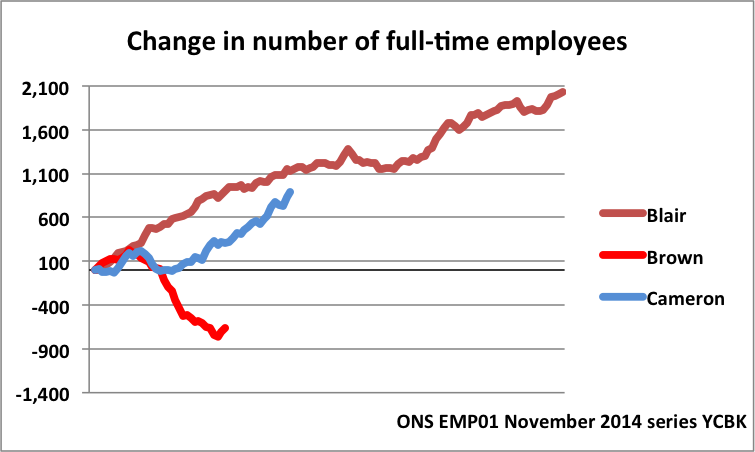 However, much of the ONS revision pushing up the number of people in employment since 2005 was in full-time employees. This has the effect of boosting Blair to a full 2 million extra employees in full-time work, and somewhat drags back Cameron. 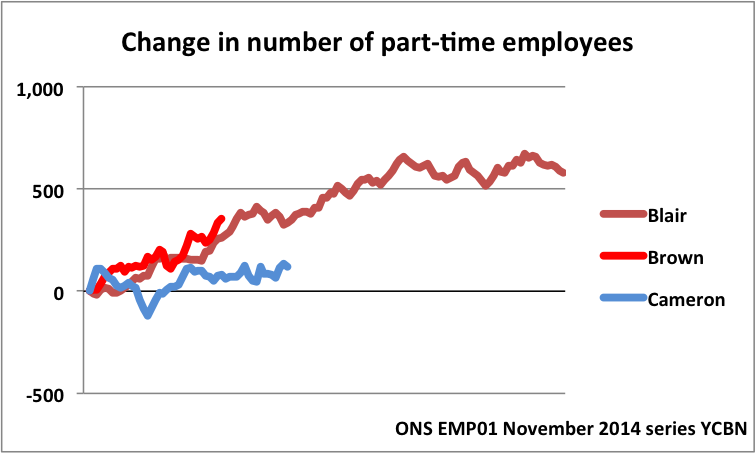 This means that Cameron is still some way from bridging the gap in terms of increase in the numbers of people in full-time employee positions, shown here in thousands. The next pictures are to a different scale from the one above, but all share the same scale for ease of comparison, numbers in thousands again. As previously noted, under Blair employment growth comprised a large amount of part-time employment, about a third of total growth by number. In contrast, the numbers under Cameron had been barely significant. The ONS revisions and passing months have made little difference to this, very slightly raising additional numbers under Cameron. 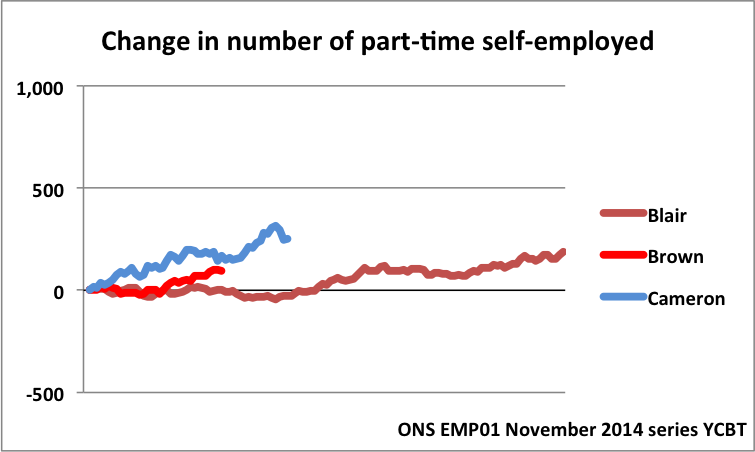 Turning to the self-employed, the contrast in the sudden upsurge in full-time self-employment under Cameron was marked. I did point out that the pace and magnitude of the change was not unprecedented - as is clear from the chart midway through the Blair years - but that previous change on this scale was not sustained and that forecasters might do well to be cautious before calling a structural change. The latest figures begin to show a remarkably similar pattern to the plateau in growth that followed the previous such increase under Blair. I'll write about this another time. So overall, the ONS revisions show that the job-maker hasn't added quite as much to the numbers in employment as previously thought, and the figures from the last few months - despite the headlines of record employment - show that key components of employment growth under Cameron have now faltered. The quarterly update on employment by country of birth and nationality also lets us see the relative contribution to employment growth made by labour from abroad. The lines are more jagged because the figures are quarterly, and for the UK-born showing a regular seasonal pattern over time, the marked increases being associated with the Jul-Sep quarter when people leave education for employment at the end of the school/college/university year. The historical picture is that employment growth among the UK-born population under Blair tailed off in 2004, and UK-born employment levels were actually lower when he left office than they had been three years previously in early 2004. These revised figures from the ONS show that over the whole period during which Blair was Prime Minister, employment levels of people born abroad increased more than employment levels among the UK-born population. Under Cameron, after what appears to have been a brief recessionary hiccup employment growth among people born abroad consistently kept ahead of growth among the UK-born population until a year ago when the usual UK-born seasonal drop did not occur, enabling UK-born growth to catch up. A little dip in the most recent quarter caused mainly by fewer people from the EU14 working in the UK has enabled growth in UK-born employment finally to overtake growth in employment among people born ooutside the UK.